This post should have happened a few weeks ago. I’m delayed in my review by all the gorgeous warm weather we’ve been having lately, not to mention fall baking! Basics: Minneapolis/St. Paul Magazine’s Taste! event. September 30th and October 1st at the TCF Bank stadium in Minneapolis. 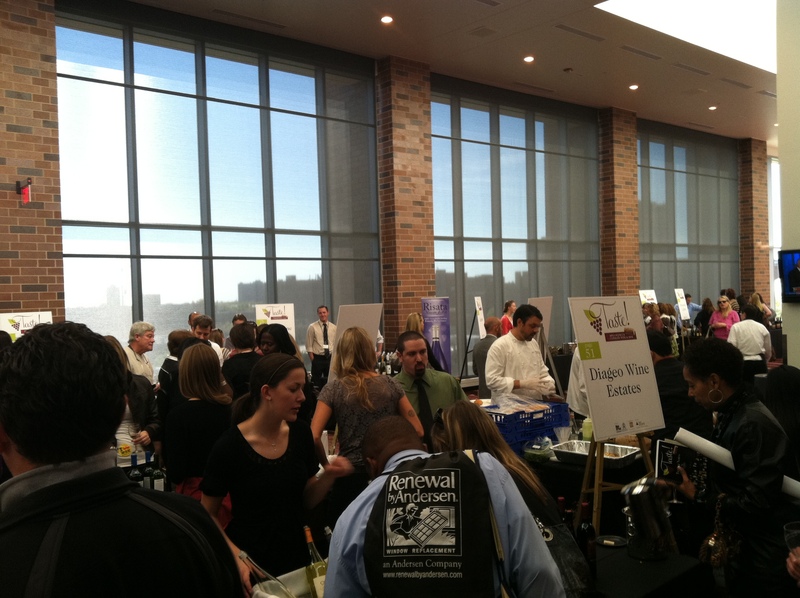 Features food samplings from local restaurants and more wine sampling that you can even hope to try. So, Taste! I love this event. I first went last year and was completely hooked by the all you can drink wine and all you can eat food. Lessons learned: grab a bottle of water right away, because when you’re 50 samples in and they run out of bottles of water, there are a lot of staggeringly tipsy people to dodge trying to chase the waiter with the water pitcher. This year was a little different. Downside: It was 2 hours shorter (my guess is to avoid the drunken debauchery that comes after a 5 hour wine tasting). 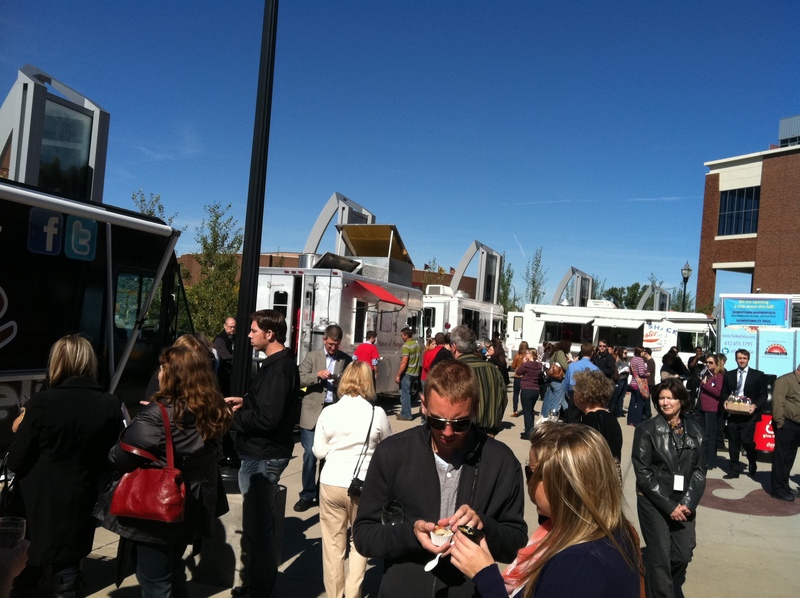 Upside: they had a food truck court with voting for a people’s choice award. A note about food trucks: I adore them. I adored them without ever having tried them because they are street food mixed with culinary creative genius. This year’s Taste! was my first experience with food trucks and I was not disappointed. My personal favorites? Gastrotruck, Turkey To Go and Cupcake On The Go. 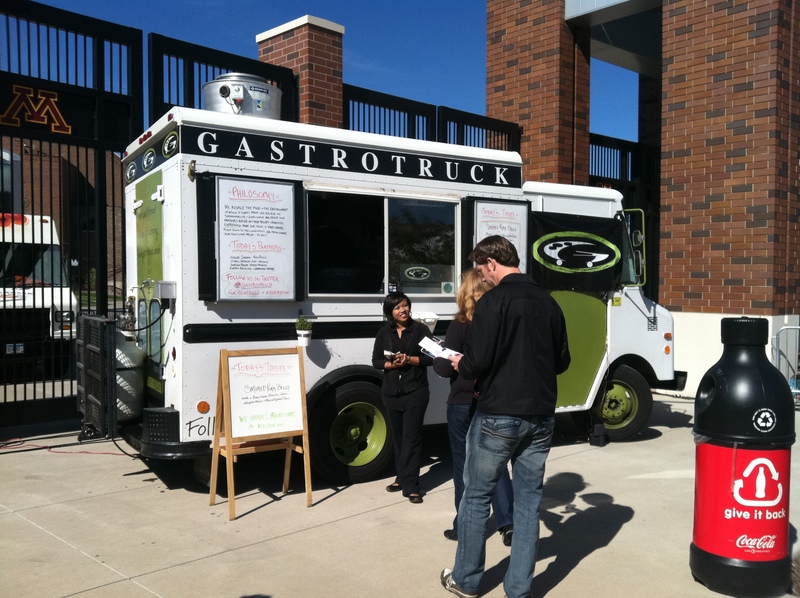 Gastrotruck because of their perfectly cooked beef and amazing polenta cake. The beef melts in your mouth and it wonderfully tangy and rich. The polenta cake was a new experience for me, I’d never had polenta but always wanted to try it, and it was yummy cheesy goodness. I’m not even sure if there is cheese in polenta, but it was delicious. Turkey To Go. I adore Turkey To Go. Not only do they have the best turkey sandwich I’ve ever eaten, but they have the friendliest chef I have ever met who, while he did refuse to tell me his secret to moist and juicy turkey, made me the above sandwich even through it wasn’t on the menu. 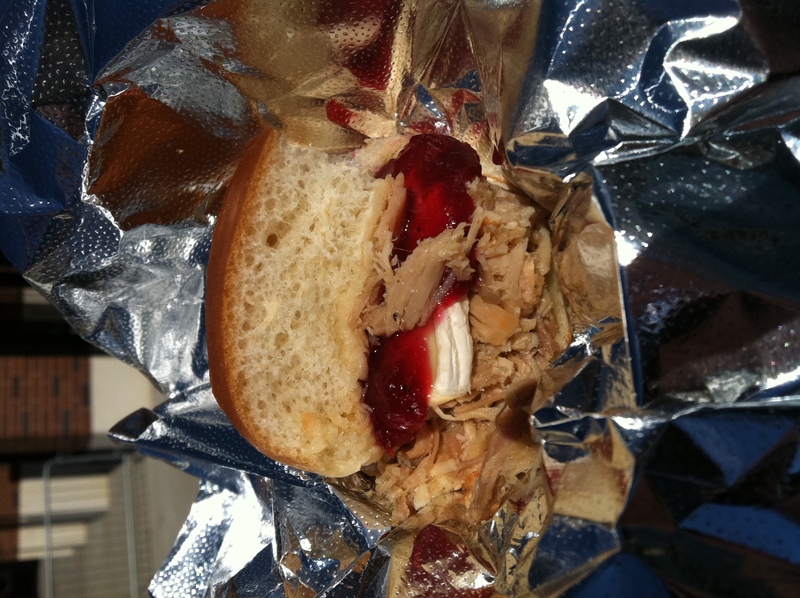 Turkey, brie and cranberry. Delicious. Thank you Turkey To Go man! Sadly (or not), I had my hands full with a wine glass and a cupcake, so I didn’t get a picture of Cupcakes To Go, but their red velvet had the tangiest (yum!) cream cheese frosting I’ve tasted on their red velvet cupcake, and an amazingly fluffy chocolate frosting on their chocolate cupcake. 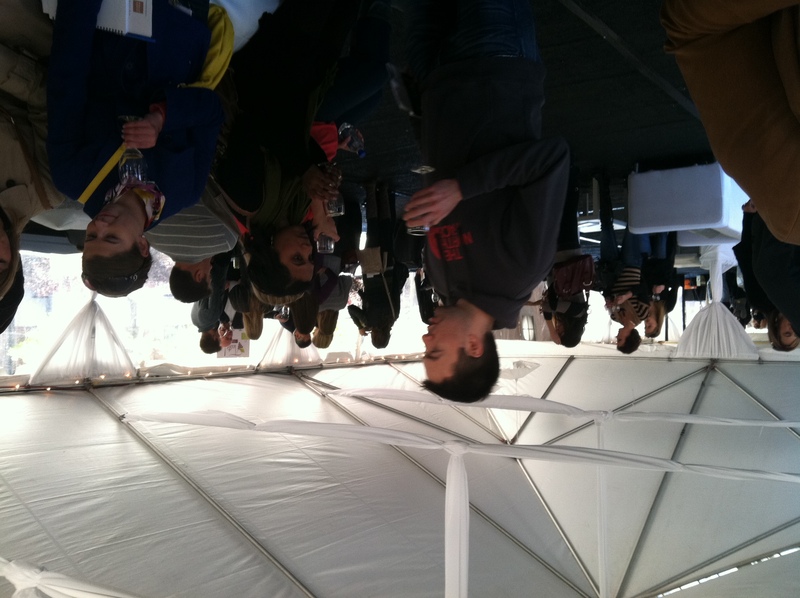 Tummies full with food truck samples, it was time to move on to the wine! Ok fine….time to go back to the wine again, let’s be honest, we didn’t make it through all the food trucks before bottles were popped. Somehow we inadvertently found ourselves in the VIP area despite our lack of VIP badges, and took a lovely champagne flight that ended in Cristal. Yes, I was sipping $200+ champagne. So cool. From there we moved into the main tasting area on an upper floor of the stadium. Thankfully the lovely people running the event give you books with numbered pages corresponding to the signage next to each wine maker and list all the wines with a scale of 1-10 and space for notes so you can remember what the heck that one wine we had was called when you go to the store. The real stand out for me was ChocoVine. I tried some great wines, but once I hit the chocolate wine, I was there to stay. It’s very similar to Bailey’s in texture and drinkability, but it tastes like chocolate. Genius. And there you have it! This year’s Taste! event come and gone, and I am certainly looking forward to next year’s. Maybe we can get a Capers contingent together and finally manage to try every single wine between the group? This entry was posted in Uncategorized and tagged Beef, Cupcakes, Event review, Food, Food Trucks, Polenta, Turkey, Wine by theculinarycapers. Bookmark the permalink. You WOULD end up in the VIP area. Polenta is basically the same thing as grits and generally doesn’t contain cheese. It’s quite yummy, no? So yummy! We should have a polenta party sometime so I can experiment with it.